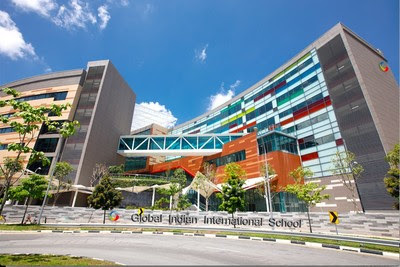 SINGAPORE – Media OutReach – 10th JULY – The Global Indian International School opened its flagship SMART Campus, the largest smart school in the world, to provide NextGen education for 21st century learning with most technologically advanced facilities. The 10 acre (3.50 hectares) has unparalleled security systems in place including facial recognition facility – a highly efficient means through which students will be able to access the entire campus. Facial recognition machines installed outside every classroom and access points are one of the fastest systems in the world to allow speedier access to users. The machines take less than one second to recognise a student’s facial imprint, which also translates into 40% faster marking of attendance. Student location tracking system allows tracking of their whereabouts across the campus and trigger alerts if they cross fenced areas. “The SMART Campus is the only international school in the world to use this facial recognition feature on such a wide scale deploying over 170 facial readers across the campus,” said Mr Atul Temurnikar, Chairman and Co-founder of GlIS. “The idea was to ensure that our students get maximum security in a safe, conducive environment within the campus,” he said. 15 other technologies were handpicked from over 100 latest technologies that could provide highest impact in improving learning outcomes. These included Virtual Classroom technology with audio-visual system, data analysis in sports, Smart ID cards for students and teachers, the world’s largest installation of digital lockers (more than 6,000), desk and collar microphones for teachers etc. Within the classroom there are two interactive and highly customised whiteboards that will allow digital collaboration between teachers and students, while SMART ID cards for teachers will serve as a master key to lock and unlock all the classroom tech enabled facilities. SPEDAS (Sports Performance Enhancing Data Analytics System) used by the likes of NBA, will capture data through motion sensors for all indoor games, which will empower coaches analyse player performances and help student players improve their game. The premises, which can accommodate 3,500 students, also has 92 SMART classrooms, 47 SMART labs and studios for skills-based learning. To foster innovation and creativity, the school has provided 28 student innovation rooms and learning commons. The school provides for 4 large multipurpose halls and 7 seminar halls. The school also provides for 3 outdoor learning facilities, such as the NEST classroom, the MIST classroom & Amphitheatre. Other dedicated spaces, like Innovation labs, Entrepreneurship and Robotics labs, Maker Spaces, Radio and Television studios etc, are poised to make the school a hub for new age learning which will cultivate skills and creativity alongside academic excellence. Winner of more than 100 international awards, Global Indian International School (GIIS) is a global network of premier international schools with more than 15,000 students across 19 campuses in Singapore, Malaysia, Japan, Thailand, UAE, Vietnam and India. Founded in 2002, GIIS offers a comprehensive range of International and Indian curricula for Kindergarten to Year 12 students. These include the International Baccalaureate Diploma Programme (IBDP), Cambridge IGCSE, the Central Board of Secondary Education (CBSE) and the Global Montessori Plus programme. GIIS’ mission is to nurture young minds into global leaders and innovators through its proprietary 9 GEMS™ methodology, a holistic approach to teaching that balances academics with sports, performing arts, entrepreneurship and character development. GIIS is a member of the Global Schools Foundation (GSF). Based on high standards of governance and established academic criteria, GSF has consistently been recognised internationally for excellence in education, and has received more than 100 awards over the past 15 years.